Iraq el–Amir is a village in Jordan that is located about 10 mi. [17 km.] west-southwest of Amman (ancient Philadelphia). It is situated along the very fertile Wadi es–Sir that flows into the Wadi Kafrein that in turn flows into the Jordan River just north of the Dead Sea. Around 180 B.C. 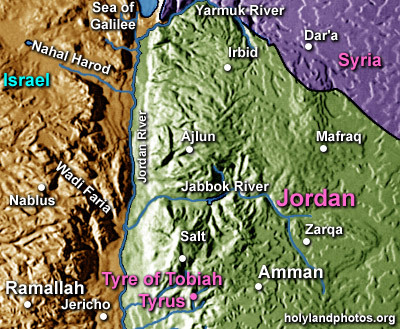 a descendant of a Jerusalemite, Tobiah (see Nehemiah 2:10, 19), named Hyrcanus left Jerusalem to live in this area. The remains near Iraq el–Amir include caves (with inscriptions), structures, and a large—usually now dry—lake that has a large palace in the center of it that is called Qasr el–Abd (“the castle of the slave”). This whole area was evidently the estate of Hyrcanus—covering about 150 acres [60 ha.]. This Hyrcanus, and his estate and palace, is described by the Jewish Historian Josephus (Ant. 12:229–33).